Print your logo onto these custom printed 2 in 1 wireless chargers and mouse pads or one of our other innovative office accessories and use them in your next marketing campaign as a unique giveaway item. Perfect for all IT and Mobile Phone related marketing campaigns, our hi-tech PU mouse mats with built-in wireless charging are a novelty item which no one should miss out! They are compatible with phones that offer QI wireless charging and are suitable for Apple 8, 8 Plus X, XS, XSMax as well as for Samsung Galaxy S6, S7, S8, S9. Simply connect charging pad to power using micro USB cable provided and then place your phone on the charging pad to start the charging process. Our custom branded mats will be supplied in white gift boxes including an instruction leaf. Prices below include a 1 colour print in 1 position. Please add extra AU$1.00 per unit for the small full colour print and additional AU$2.00 per unit for the larger print. 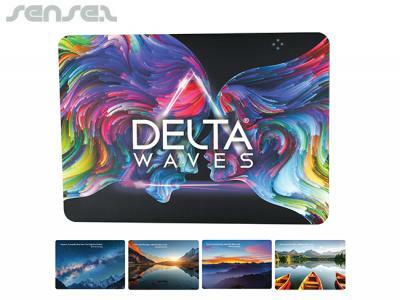 Other innovative corporate gift ideas that could be suitable to create brand awareness include these cheap promotional Multi Function Mouse Mats, quirky advertising gifts such as these Allura Phone Charging Mouse Mats or how about using one of our more bespoke custom made products such as these great quality High Standard Mouse Mats - 3mm Rubber Sponge? Custom brand these leatherette notebooks (a5) or one of our best-selling promotional office accessories with your company logo! Your promotional 2 in 1 wireless chargers and mouse pads can be silk screen printed in 1 or more colours. Costs shown include a 1 colour logo print on your custom branded 2 in 1 wireless chargers and mouse pads. We can print more than 1 colour, however it incurs extra costs. We can achieve a perfect PMS colour match for the print. Personalise your 2 in 1 wireless chargers and mouse pads or custom design office accessories for your marketing campaign. How can these unique promotional 2 in 1 wireless chargers and mouse pads or our personalised office accessories fit in with your marketing strategy and help you maximise your brand exposure? Our custom made 2 In 1 Wireless Chargers And Mouse Pads can be produced from a minimum quantity of 50 pieces. We can have your logo branded on these corporate 2 In 1 Wireless Chargers And Mouse Pads in Full Colour Digital Print or 1 Colour Silkscreen Print. A setup fee of NZ$170.00 will apply to make the film.